In this post, we will try to understand the basic concept of "Fluid coupling". 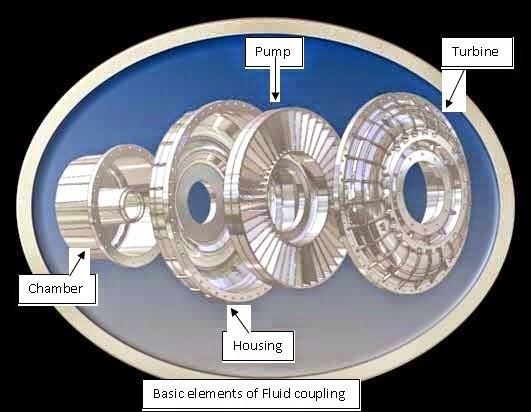 First, let us understand what is fluid coupling? Fluid coupling is also known as Hydraulic Coupling and it is basically one hydro kinetic transmission device that will act as a centrifugal pump and hydraulic turbine. I have noted wide application of fluid coupling in large conveyor belt drive system and also fluid couplings are using these days as one substitute of mechanical clutch in automobile transmission system. Let us understand how a fluid coupling works? First of all we will have to understand that first two elements that we have discussed above may work as pump or as turbine also. 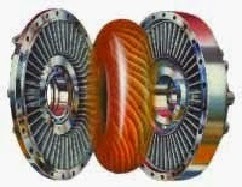 Impellers will act as hydraulic turbine and also act as centrifugal pump. Input energy source will be either electric motor or diesel engine. Electric motor will be connected with the driving impeller i.e. Pump. 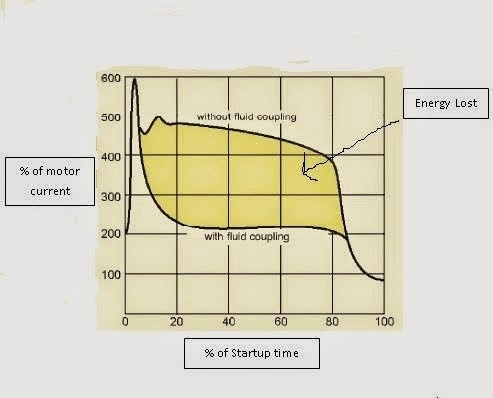 Mechanical energy (Kinetic energy) will be transmitted to the oil with the help of the pump in coupling. 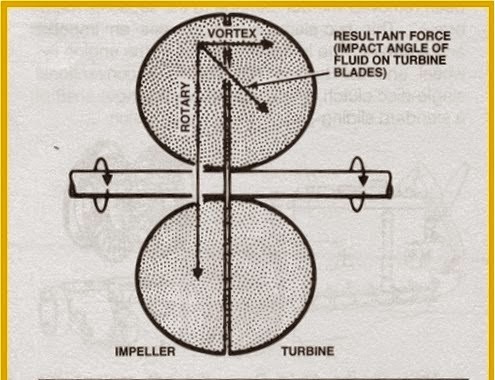 Due to the centrifugal action, Oil will move around the turbine blades in the direction of outside of coupling. 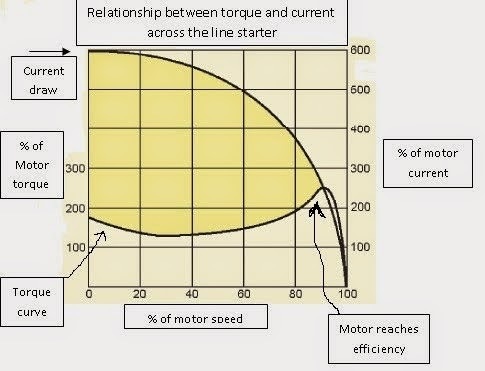 Turbine will absorb the kinetic energy and will produce a torque which will be always equal to the input torque. Hence, output shaft will be rotated. Now the questions are generally being asked, how impeller turns the turbine. 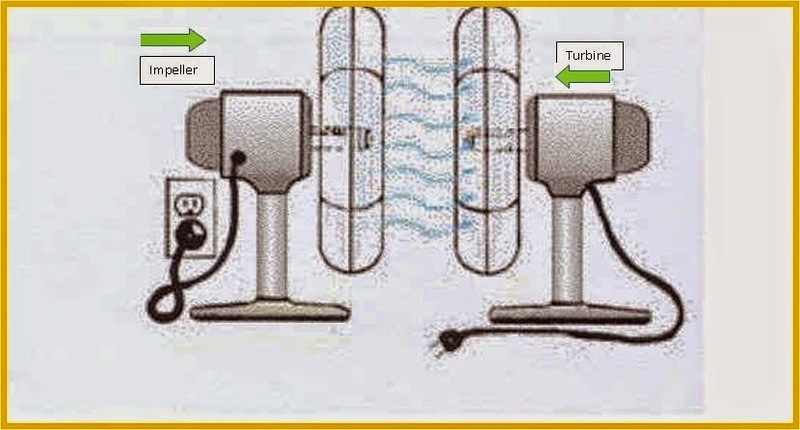 We can understand the concept of rotation of turbine with the help of following figure where one fan is acting as pump for transmitting the air towards the next fan blade to rotate the blade of second fan. As we know that there are no mechanical connections hence wear will be zero and efficiency will be only affected by the difference in speed between turbine and pump. Speed difference is termed as slip. Easy starting with steady acceleration of driven element. Drive train will be protected against overload. Rotational vibrations will be dampened. Direct on-line start electric motor might be used without using star-delta starter. Automatic load speed adjustment possible by considering the concept of synchronous speed of two or more than two motor. Even during installation, we aligned carefully the shaft but there is possibility of some misalignment such as parallel and angular misalignment due to shifting of driven and driving unit. We may refer the following figure for inspecting the angular and parallel alignment with the help of using dial testing indicators by fixing indicators nearby the OD of flanges as we have displayed in figure and then we will have to rotate the coupling by 360 degree. There are some important points and we must have to understand these points. 2. After 25 days of installation, we must have to check each fasteners, fusible plug and alignment. We will have to replace the oil by cold oil. We must note that it is only advisable to change the oil after 20 days during first time but after that we will have to change the oil after 4000 running hours. Reasons of hydraulic hose failure"